Despite the fact that I started out July thinking I would “be bold” and post more frequently, I have gotten caught up in the crazy of summer life. I have gotten caught up in my work, reading the books necessary to complete that work, preparing for college, cleaning up and throwing out. All this amid the daily routine of household chores necessary to maintain a functioning home. Sometimes, I begin to feel I am losing my grasp on what is real and necessary and beautiful. It seems out of necessity, I have been cramming too much into the summers. Actually… into life. I spend my days cramming too much into life. Too many jobs, too many chores, too many errands, too many appointments. These things take a toll, but as I prepare to pay tuition bills, I am hit broadside with the reasons why I constantly push, always taking on more. But cramming in so much is not always a good thing. Quality, simplicity, and reflection would be good things. These things would give me the ability to shift my perspective, breathe, and re-evaluate the crazy that dominates my days. Maybe find a better balance. Each time I think I am almost to the end of my crazy, a new string of commitments and appointments makes non-crazy an un-truth. Once again, the crazy continues, off-kilter and out of balance, but next week looks promising…. Kinda funny about next week. There’s always next week, isn’t there? And next week always brings new hope for just a bit more balance. I work from home during the summer, so this year I have decided to take advantage of the more relaxed schedule to take on the project of cleaning out my house. I am not moving. My kids are not moving. But we have way too much stuff in our relatively small townhouse. Rooms are not being used to their fullest potential, and the clutter is beginning to take over. We have lived here for 14 years, and it amazes me that we have acquired so much stuff without weeding out what we are no longer using. Yikes! So this summer, I am getting rid of all of the junk, clutter, and just stuff we no longer need. This stuff—it doesn’t matter to me. 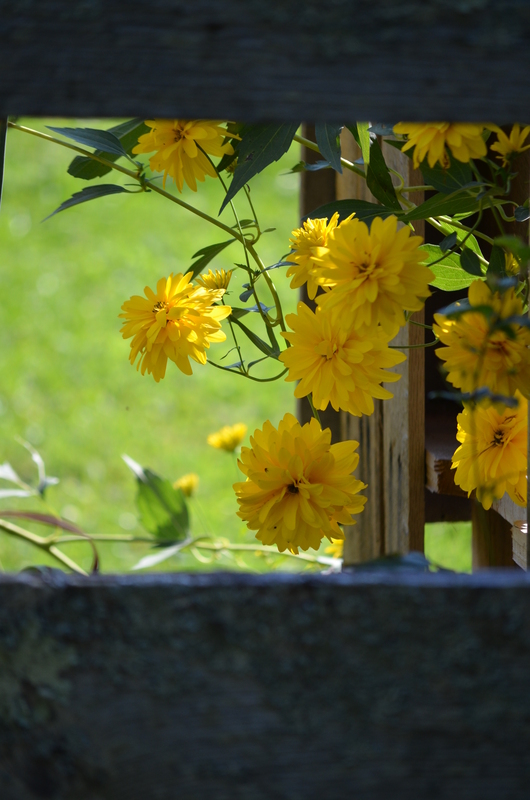 Living life without all the encumbrances… that is what matters. One step in the process is to sell whatever is still useful, usually on the local online yard sale sites and usually at a steal. Last weekend was my first foray into the online yard sale arena. I posted two items of furniture, just to see what would happen. I posted the items late Friday night right before I went to bed, and by Saturday morning, no one had responded. Yep, the immediate gratification we have all come to enjoy on social media was not happening. So I sat down to work in my online classroom, figuring I was not going to sell my items, but knowing there is always the donation route. It wasn’t long before I had messages from individuals interested in both of my items! And I was messaging them back to decide on a pick up location and time. At one point, I was messaging one of the buyers about a pick up time while simultaneously messaging a friend about something completely unrelated. My son looked on, unaware that I had pulled in a chat with a friend as well as the two buyers. “Get them bidding against each other,” he told me. “That’s the way to maximize profits and minimize friends!” This last statement held a tiny hint of glee, as if he had just given away some closely guarded secret. Yes, I thought. If you are a businessperson. But this stuff (and its complications) doesn’t matter to me. My focus for this summer is to simplify. Simplicity will be the best reward! There are days—too many, if you’re asking my opinion—when I have run out of some food item or other, and I have to stop at the grocery store on my way home from work. Grapes come to mind, for instance. Or milk. 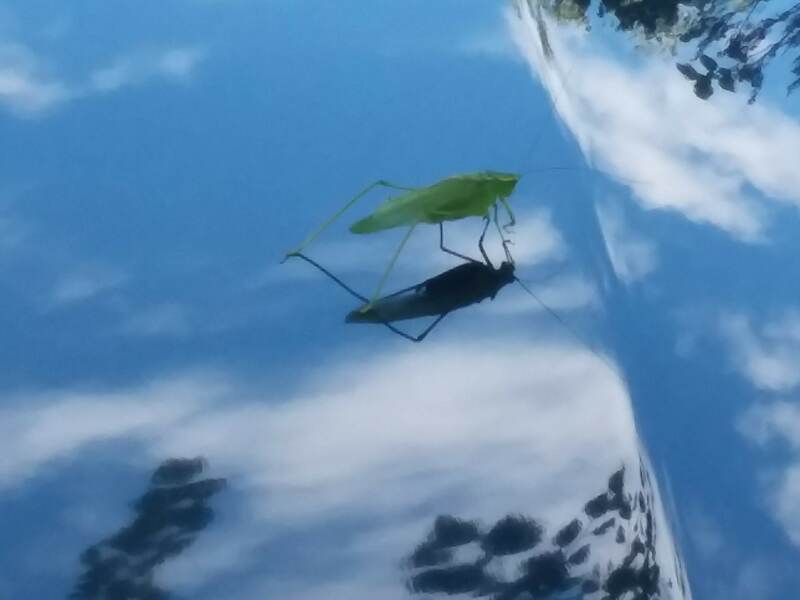 So the other day, I was on my way into the store in somewhat of a rush. Someone had planted one of those “Gotcha!” displays right as you’re walking from the door to the food aisles, and you have to walk right by it because the cash registers prevent you from walking a different way. The “Gotcha!” displays are there to grab your attention and convince you to buy something you absolutely don’t need and didn’t intend to buy when you walked in the door. 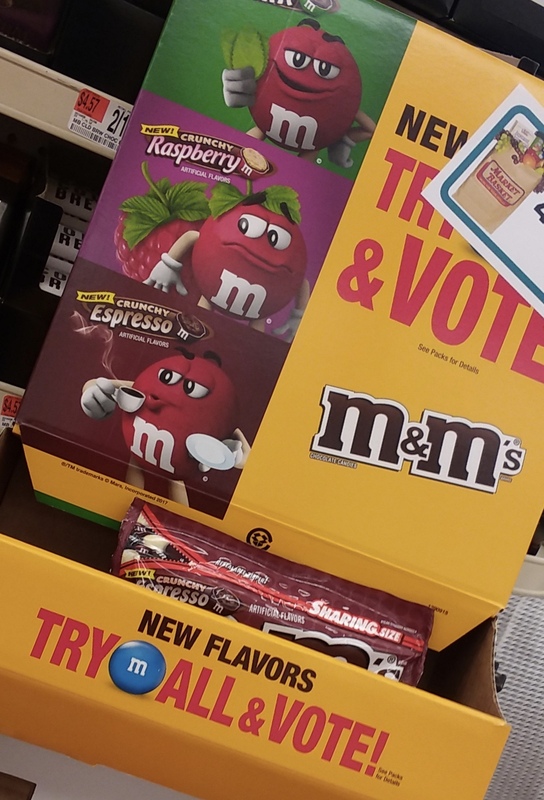 On this particular day, I discovered that M&Ms had three new flavors, and the display urged customers to buy all three and vote on their favorite. But what caught my attention was the bright pink bag. New M&Ms? In a bright pink bag? What flavor could they be…? And like a magnet, the colorful display pulled me off my very focused task of buying Oreos (because those are healthy), grapes, and strawberries. I stood examining the bag, the flavor (raspberry crunch), and anticipating how that flavor might taste for just a split second too long. “Ma’am, you don’t need any of those,” I heard from behind me. I turned to see a man, a complete stranger, leaning on his cart, waiting to get by my distracted self. I considered this interruption, and I smiled. “Thank you,” I said. “You are absolutely right. I do not need those. I was trying to figure out what flavor they were. And for a split second, I wanted to say, Oh, your wife needs them, but I don’t? But I didn’t because this man had just saved me from hundreds of unnecessary calories. “Have a nice day!” I said instead. “And thanks again. Because I really didn’t need those!” I took my basket and walked away smiling. Someday, I thought, I am going to master the art of interference so I, too, can thwart someone’s encounter with the “Gotcha!” display. I went grocery shopping on the way home from work yesterday. Grocery shopping is probably my least favorite job of the week, so I would definitely consider it a chore. It was Friday afternoon, and the market was crowded with faceless shoppers on their way home from work. The only thing that would have made it worse was if there had been an impending snowstorm when everyone has to go out for bread and milk. Who knows why…. Anyway, I picked up everything I thought we might need for the majority of the week since I don’t want to go back right away. I got bread and milk and meat and veggies. 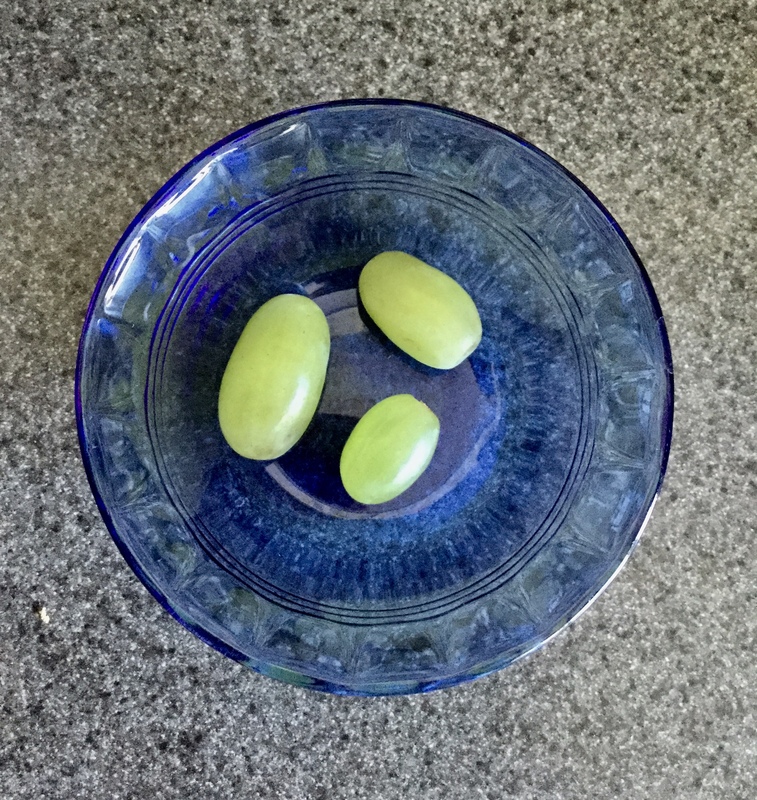 The grapes looked good—green with a hint of blush (and they were not mushy)—so I picked up a couple pounds them. I might have gotten more, but I’ve learned over the years. If I get grapes and they are a touch too sour or the flavor isn’t just right, no one eats them. I arrived home to two teens who could help me unload the groceries while I started dinner—it was fairly late by this time. I pulled the grapes out of the bag and tossed them into a colander and washed them. I tried one, and it was the perfect flavor and firmness. I ate a couple more as I made dinner. When J came into the kitchen to set the table for dinner, they were still in the colander in the sink, so she tried one, as well. Her reaction was nearly identical to mine. “Ooo, those grapes are good!” she commented, stuffing a couple more into her mouth. “Umm, dinner in two minutes!” I told her. “They can be dessert!” she informed me, eating a few more. When dinner was nearly done, J brought the grapes to the table. With two teens digging in, those grapes didn’t stand a chance. By the end of the meal, there were three grapes remaining. The two teens were too stuffed to eat even three grapes more. Just once, I would like to come home from the market and not have to return in another day or two to pick up something that we have run out of. Apparently, this week is not my week. At least I can take comfort in the fact that they’re eating healthy! On Christmas m orning, we woke up to the quintessential “white Christmas.” Snow was falling thick and heavy, sticking to the trees and piling up on the lawn and driveway. It was the scene everyone longs for on Christmas. Let me take a moment to explain my use of quotes on the term “snow shovel.” In my parents’ house, the shovel that had been used (for many years) to rid the walkways of snow seems to be more of a lightweight garden shovel than an actual, dedicated snow shovel. Sure enough, the shovel that I expected to find was standing at attention on the floor of the shed, waiting for me, taunting me, no doubt. Mom had also offered me a beautiful, rusty child’s snow shovel that I had when I was a child, back in the Dark Ages. This shovel held a picture of a cheerful snowman, and the handle was wiggly and just a few sizes too short for my adult frame. I used the child-shovel to do a quick scraping of the stairs before I grabbed the larger shovel and headed out toward Mom’s car. After I removed the snow from the car (with a proper tool, not with the shovel! ), I started to clean out the snow around the car. I shoveled, removing the snow so she would be able to get to the drivers side door without incident. The shovel was heavy with a long handle. It wasn’t flat like the scraper I was used to, and I struggled with it. With each scoop of snow I threw, I could hear Dad’s voice: “I’ve used this shovel for 40 winters, and it has always served me well. It’s a good snow shovel, nice and light.” Clearly, Dad had not held one of the newer plastic shovels designed specifically for snow. If he had, he’d know it was the right tool for the job. From the car, I shoveled a narrow path down the driveway, a temporary walkway until the plow arrived to remove the snow from the driveway. When I was done, I retreated to the cozy warmth of the house. 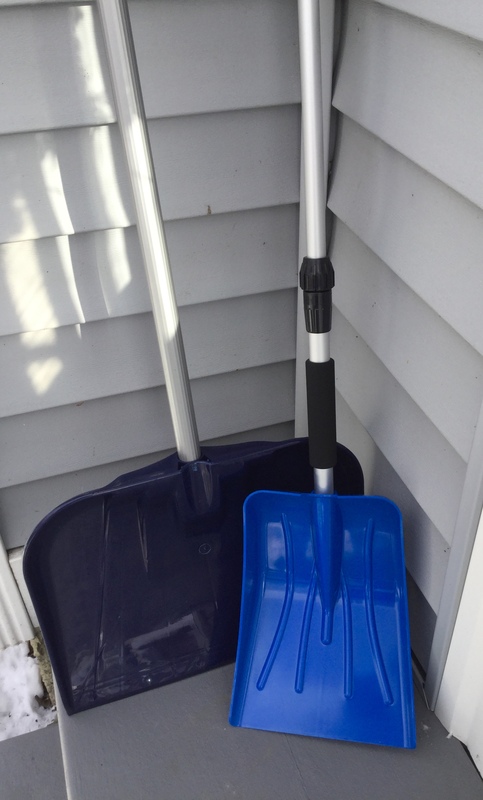 The next day, I went out and purchased two new shovels for Mom, one large with a wide, flat blade and one, a very small scoop with a telescoping handle. It was far from an extravagant purchase, but Mom now has the tools she needs for the next storm. However, I am willing to confess it was maybe a little selfish of me. 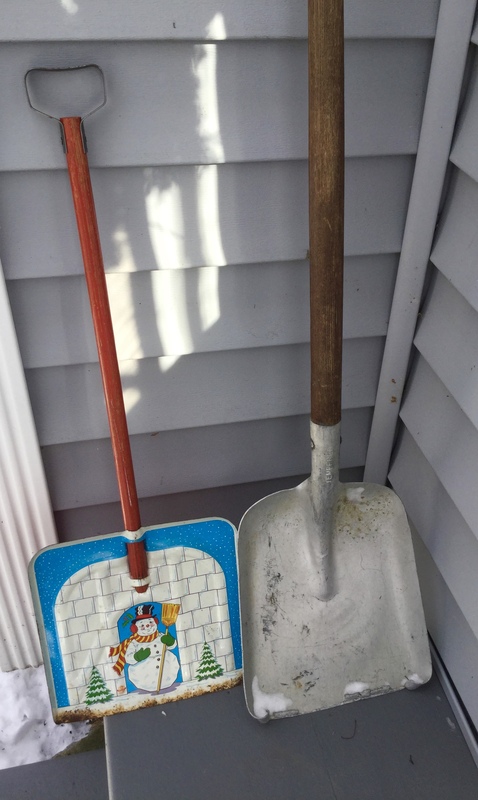 Now, when I’m at Mom’s house and it snows, I have the shovels I need so I don’t feel like I’m stuck and trying to dig out from the 1950s! I am pretty sure my father would have secretly loved to have a son. I say secretly because when you have two daughters, you can’t really express a fact like that. “Oh darn. I really wanted a son!” But if he’d had a son, he would have been very happy. However, my dad always made sure that my sister and I knew how to make simple repairs and improvements around the house. When he embarked on a project, he would often recruit us to “help,” which allowed him to impart wisdom and instructions as well as dos and don’ts of home repair. When my children left for a recent trip to Florida, I knew this solitary time was my opportunity to re-caulk the tub in their bathroom. There is no denying the fact that I know how to have a good time when my kids are away. Really, the only time the tub is not in use for several hours a day is when they are away, and anyone who has ever caulked [successfully], knows the tub and its various components need to be good and dry before the new caulk is placed. When I settled in to remove the old caulk, I decided I would do a better job if I could just remove the tub spout to better clean off all of the tiny remnants (or large gobs) of caulk that had made their way under the fixture. But how to remove the fixture? It seemed to twist, but just in case, I consulted YouTube. There, I found a tutorial on how to remove (and replace) an old tub spout. 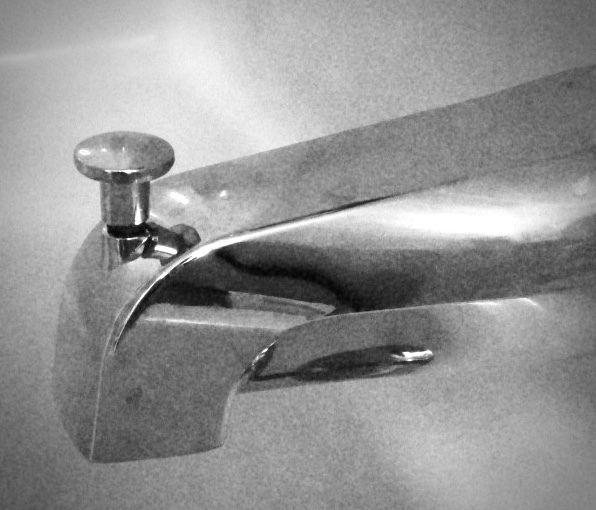 Replace had not occurred to me, but a new tub spout would be just the thing to make the tub shimmer! I took a trip to the local home improvement store where I found the parts I needed. At the checkout, the cashier looked from my purchase to the old spout that I had brought along just in case I needed a visual example. “That’s a good idea,” she said, pointing to the old spout. “To bring that along.” She paused for a moment, and then she said, “Are you doing this all on your own?” I nodded. Not really. I must say, I was trained by a good man to recognize that many projects are not as overwhelming as they might appear. In truth, it’s not a big undertaking to change a tub faucet. The big undertakings I leave to professionals. Back at home, I finished my project. It was straightforward without any frustrations, and I must say, it looks pretty good. Typically, when I finish a project like this, I would call Dad. “I just changed my tub spout,” I would tell him, and his first response was always the same. “Did you?” he would respond with a hint of pride in his voice and then we would talk about what I had fixed and how the project had gone. Recently, I have taken on the job of sorting through stuff. The stuff in question consists of items that were hidden in long forgotten boxes stashed in the attic of my childhood home—old family photographs, school papers, letters, greeting cards, books, newspaper clippings… you name it. Every now and then, in amongst the useless stuff, I encounter a rare—albeit worthless—gem, and sometimes, I feel the need to share it before I throw it out. 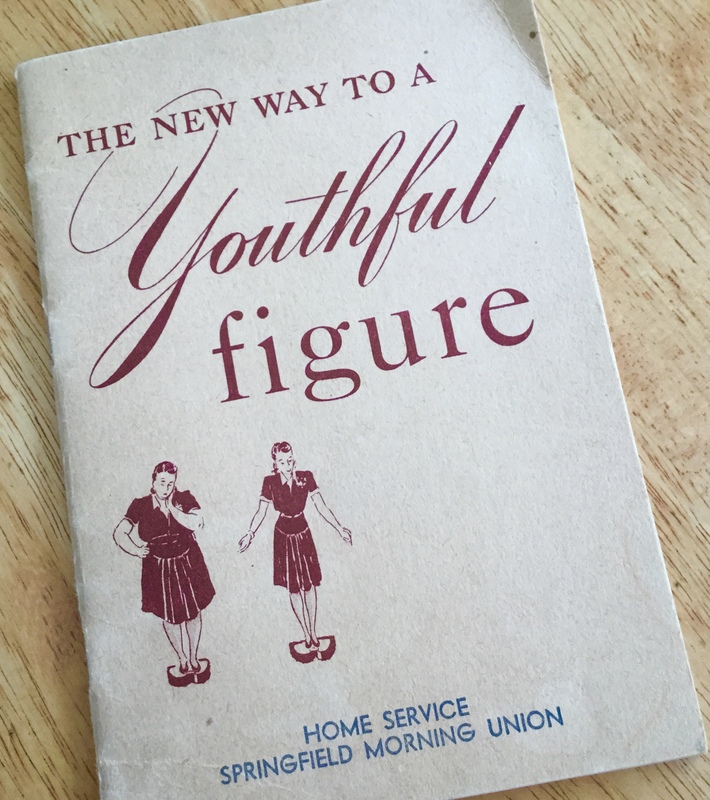 Being a woman of a certain (non-youthful) age, I was immediately intrigued when I came across a 1941 booklet entitled “The new way to a Youthful Figure.” I am most likely the exact target demographic of this publication, though two generations out. In fact, I have finally hit the point where I can put on a pound or two just looking at ice cream, which does not thrill me. So I opened the booklet to see what the 1941 trending logic was to maintain—or regain—a youthful figure. There is a 3-day cleanse to begin. And we are assured, “By Monday morning your system will be thoroughly cleansed. You will be so hungry that the reducing menu will taste delicious.” Ah, now that’s the ticket to a successful diet—starve yourself first so you are happy to have anything edible! Your stomach will be happy, but your brain might be foggy. 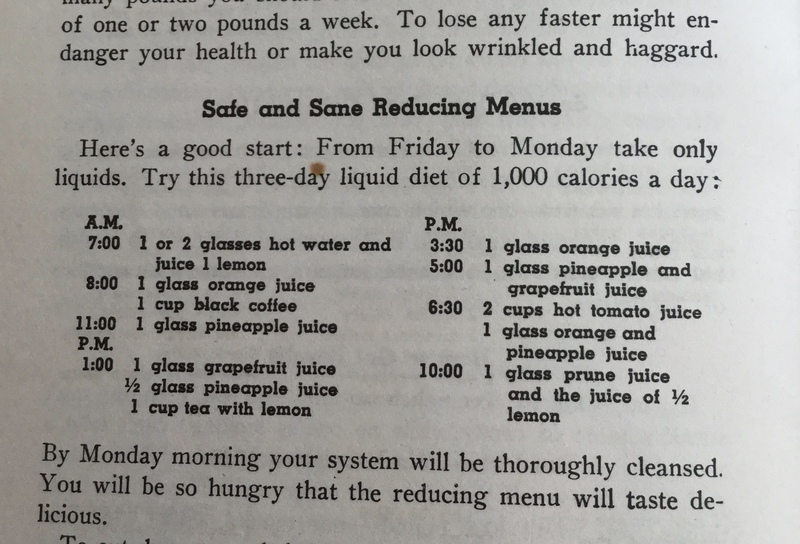 In the back of the booklet, there are menus to help limit calories each day, and there is a lengthy list of 100-calorie portions. Pretty typical. “The reducing menus, pages 15-19, provide all the nourishment your body requires. Moreover, if carefully prepared, appetizingly served, they are not only satisfying but delicious. If you follow them carefully, with absolute honesty even for a few weeks, you may look in your mirror some morning and cry, ‘Eureka! I have a waistline! And behold this faint blush of rose in my cheeks! It’s amazing how fit and lively I feel!’” I don’t know about you, but the day I talk to myself in the mirror this way is the day I might need to be moved to a safe location. Should you feel the need to read this booklet, I would be happy to scan it and send it to you. Heck, I’ll just send it to you, so you can have the original! And I will go back to sorting my stuff. I’ll be sure to share any more gems I find. Meanwhile, I am caught between advising readers to sort through and dispose of their own clutter so that others won’t have to do it and advising readers to save a few completely useless items just to give future generations a laugh or two.